How do delegates communicate with each other at your conferences, expos and summits? 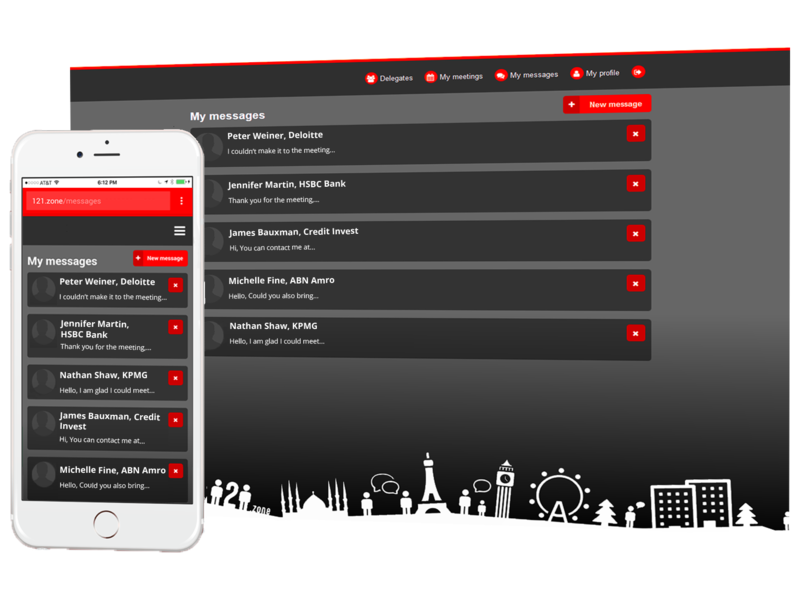 121.zone is a simple, intuitive and cost-effective web-based application that allows delegates attending conferences and exhibitions to send each other chat messages and meeting invites. to communicate with specific people. Setting up 121.zone for each of your events is simple and intuitive, and does not require any specific IT skills. 121.zone has been designed for companies organising and hosting conferences, summits and exhibitions. All these companies have one thing in common: they all see that the success of their events is determined largely by the amount and quality of interaction between participating delegates. If you would like to take a look at 121.zone, simply write to us here expressing your interest. We will happily send you a delegate Username and Password to access an example event where you will be able to test functionality, usability and design. Simply write to us explaining what your business does, how many events you typically run per year and what you would like to achieve by using 121.zone. Our prices are very economical. You can buy for one single event as an initial test or for multiple purchases. Contact us now for more information.